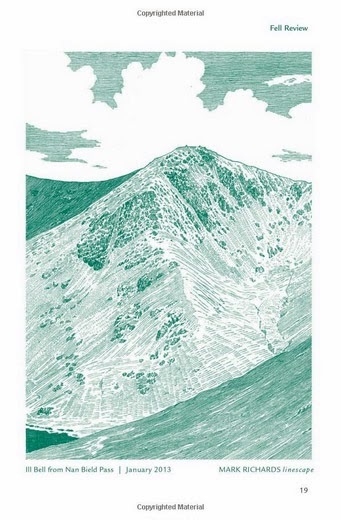 With the gorgeous Upper Kentmere Valley inviting you on the front cover, you know there’s something special about this book. The 332 pages also tell you this isn't a book done by halves. Then you spot who it is written by – and you know you’re in for a good read. And I mean that from the point of view that Mark Richards' text has a poetic flow to it which almost demands to be given more time to. Many walking guide books only really work when you are using them on the fell – this works as well when you’re sitting at home using it to plan your next journey. And that’s rare. To highlight this is the inclusion of a fabric page marker – you don’t get that in a standard walking guide book. This is a book intended to be read. This book is the combination of an odyssey which began in 1989 when Mark Richards was still living in his native Oxfordshire. Inspired by the great Alfred Wainwright to jump into writing, Mark launched himself into being a full-time preparer of walking guides – at the age of 40. Strange, as in 2014 I turn that age too… Is there something about that age…? 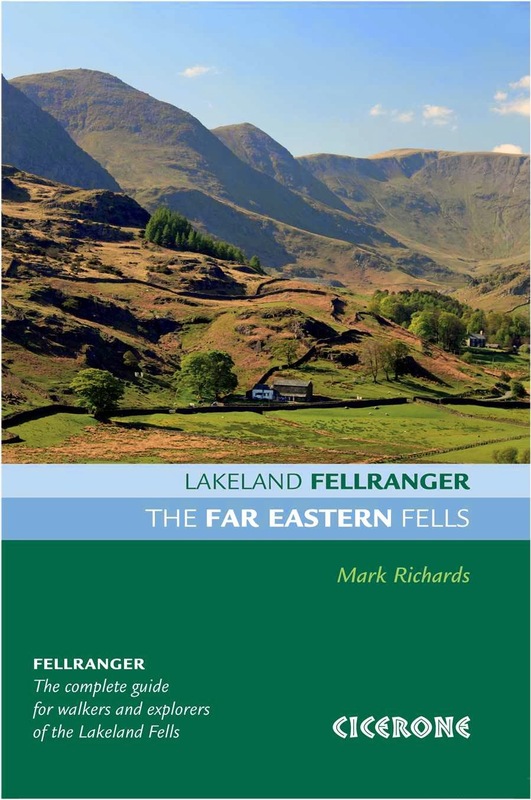 Anyway, as I mentioned, this book is the last in a series of eight books dedicated to walking the fells of the Lake District – with each of the eight books focusing on a different area. 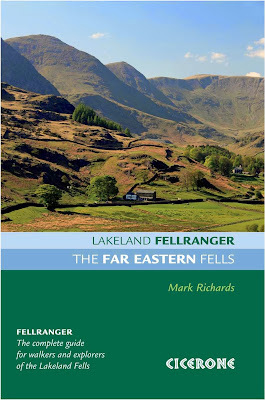 After 14 years, Mark has walked the 227 fells mentioned in those books many times in all weathers and seasons – the result is a most complete set of walking guides for the Lakeland area, if you are lucky enough to possess all eight. Now here’s where I have to tackle the inevitable comparisons to Wainwright. Firstly, is seems wrong to call Mark “Richards” in the same way as we all use “Wainwright” so I’ll use MR and AW. Ok. MR has eight books in his series, whereas AW had seven (MR includes the Mid-Western Fells in a separate volume). AW’s list of fells total the famous number of 214, whereas MR’s total 227 as I’ve mentioned. It took MR 14 years to complete the eight books and Wainwright took 14 years to write his seven. There are similarities too. Like AW, MR – oh that’s enough, Mark – is quite the master at pen and ink drawings, and the products of this talent are liberally used throughout the book – both as pictorial guides to the different routes up fells, and as piece of art in their own right. In this age of iPads and digital imagery, it’s so pleasing to see good traditional ways of illustrating in a major guide book. Great attention has been place in the design too. The aforementioned line drawings and photographs are well spaced out, and indeed there isn't a page which doesn't contain a photo, a line drawing or a map. And of the maps, there are two notable points. Firstly, they are the Harvey versions – which provide a welcome change of style to the omni-present Ordnance Survey ones. Secondly, the maps aren't constrained within boxes here, they are allowed to flow out and live on the page. So much so, the maps often take over a full page – and on my favourite pages (102-103), the map almost covers the whole double page spread. 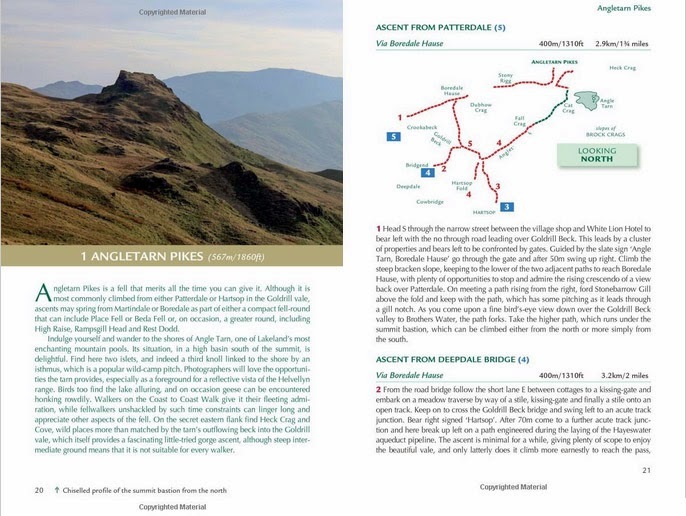 (yes I have favourite pages… The panoramas are also well-made and very useful – laying out on a double page spread what exactly you can see from the summit of each fell. So onto the routes and the descriptions thereof. Well, here is Mark’s triumph with this book. The words really describe in great detail what, where, how you can achieve your goal for reaching the summit of the fells. To prepare this review, I followed Mark’s descriptions to 3 different fells, and found the detail to be astonishing – with a clever balance between direction and information. I would never advocate anyone to go out walking in the Lake District without a map – but if my map was taken away from me, I’d want this book instead. And Mark describes alternative routes to each of the summits – where possible – giving you additional walks in the future by taking the many different variations.